Twitter’s “mentions” system using the “@ reply” is super handy. Webpages should have them. When someone links to your page, you get a notification. By email. Or use the web browser notification system. WordPress’ trackbacks and pingbacks are a step in the right direction. Sure, I can run Google Analytics and track these kinds of things, but it should be automatic and you should be able to get pinged when it happens in real-time, with little effort on your part. Google Alerts doesn’t seem to do the trick. I see lots of links to this blog in the WordPress stats that do not appear in Google Alerts using the method that link suggests. If I am using the official Twitter software, or the official Twitter extensions in my browser, or using the Twitter website to generate a new tweet, it would be a handy feature for everybody involved if the extension or the app itself was able to check the domain, see if the user has a Twitter account, and add it to the tweet. Make it a optional with a checkbox. Drafts is an “idea Inbox”. Launch the app, type your text, and then decide where it needs to go or be used. You can send it in an email or a text message, post to Twitter or update your Facebook status. 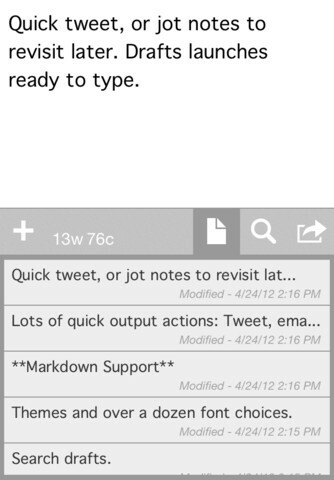 Send the text off as a new note in Evernote or save it as a text file to Dropbox. You can hand it off to the clipboard or other writing apps, and it’s the fastest way you’ve ever entered a new event in the calendar app. Drafts launches fast so you get the idea down first, and then decide what to do with it. After you use it about three times, you’ll wonder how long before Apple will buy the developer out and add it to iOS. Check out my tips for using Drafts. Flipboard is a tough app to describe. My best attempt: a “newspaper” style app that presents a customize selection from your existing apps and services. Flipboard can pull in “top” feeds, Flipboard-curated feeds and other major sources, but the real fun is adding your accounts like Facebook, Instagram, Flickr and others. Why? Because your interactions with items within Flipboard are just like being not he actual site.